HOME In August of 2006 planning started for the successor to my wagon diorama. The diorama was built on pink foam and though I was happy with the diorama I was not too happy with the track work on foam. I started thinking about another diorama built in a more traditional way using plywood as a sub-roadbed with Homasote on top of that. I had seen a commercially available bench work product from Mianne Benchwork at a train show and filed the info for future use. The new modules plan seemed like a good opportunity to give it a try. The price for one 2 foot by 4 foot table was around $100. I compared the price to the cost of planning, purchasing lumber and the labor to build tables and decided it was a bargain! Though their product is not set up for portable layouts a phone call to them got me two tables with legs cut and quick disconnect fasteners installed. The tables assemble with turn lock fasteners and in an hour or so I had two tables ready to go. I also decided on the commercially available Homabed roadbed product to save the hassle making my own. I removed the structures and trees from the original diorama and tossed the rest. Initial planning started by cutting some 1/4 foamcore to the tabletop sizes and sketching in some rough track and structure locations. I had my original structures as well as some additional laser and craftsman kits in my "round tuit" closet. I had a finished ore bin built some time back and this got me focused on a mining theme. I had a mine building kit and had been buying bits and pieces of detail for a mine scene so this was the direction I took. I wanted to have structures to play around with during planning but rather than building them I scanned the laser cut building sides, printed them out and pasted them to foamcore. Walls were cut out and assembled with hot melt glue. When trying to plan a layout with structures this is a great way to have the actual building sizes available. Even though On30 has smaller rolling stock, the buildings are still 1/4" to the foot and take up a lot of room! 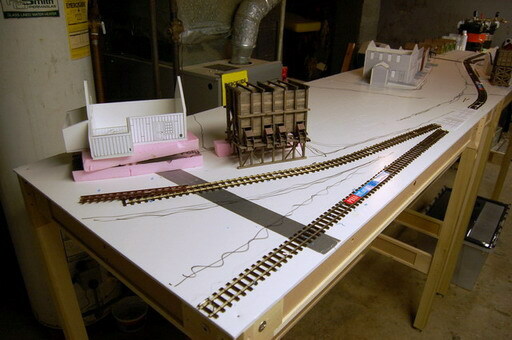 Some Peco flex track and turnouts were used to plan the track work but I planned to try hand laying when the time came. Once I was satisfied with the track and structure layout I started thinking about getting the mine elevation needed and how I would run a road up to it! I also though a water feature would be nice for the track to cross. Adding 1x3 pine framework on top of the bench work provided for this option. Next step...the frame work.